The first step to becoming an options trader is to learn more about it. If you asked us “How do you trade options?”, we would reply “With great care!”. As good as options sound, with a bad strategy or no strategy you might be faced with substantial losses! Exchange traded options are a great investment tool for any optionable stock in the US and Australian options markets, as well as other global options markets. They enable you to control a large number of shares with a relatively small amount of money. That’s called “leverage“. They are very flexible, allowing you to take advantage of upward, downward or sideways movements in the market. When you experience market movements in your favour, you can buy your stock at potentially a large discount to current market prices, or sell your stock for a lot more than it may be currently worth on the market. And best of all, with the correct strategy you are always able to strictly control your risk. Like we said, with a bad strategy or no strategy you might be faced with losses! The two parties in an options contract are the buyer (taker) and seller (writer). In a sense the seller and the buyer are betting against each other on the future price of an underlying stock. What the seller gains, the buyer loses. What the buyer gains, the seller loses. Apart from brokerage and fees, it is a zero sum game. So as much as you can achieve brilliant profits, the counter party at the same time will experience a loss! You have to educate yourself and learn how to reduce your risk and increase your profits! There is a lot of free information available in the public domain, like on our website, or through our Free Options Trading eBook. We impress upon you to put some emphasis on learning as much as you can about options, because this will increase help you increase your profits and limit your losses! Once you have absorbed all the free information available to you, you will know whether options trading is for your or not. As a next step to becoming an options trader you should consider further options trading courses like our Options Mentoring program. Of course you could simply start trading and do your own learning along the way, but it has taken most successful options traders many years to arrive at the level of success they are at, and many more didn’t make it because they ran out of capital. Please make sure you learn how to trade successfully from a reputable business or mentor. It is a great idea to google the mentor you are considering and look for scam warnings, reviews or mentions on trading forums. At Options21 we believe that the smoothest and fastest path to success can be found with the guidance of a good trading coach or mentor. That’s why we have developed what we believe is the most professional in-depth options mentoring program around. Options education is often viewed as an “unnecessary expense”, but the losses of your first badly constructed options trade will make the cost of mentoring look very small indeed. 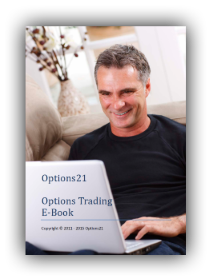 To see examples of trades which demonstrate the trading methodology taught in the Options21 mentoring program, please visit our trade examples page.